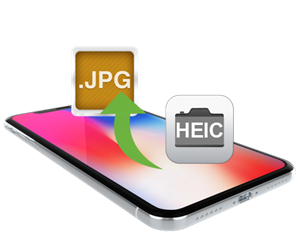 With HEIC replacing JPEG/JPG as the default photo format on iOS 11, it's all the more necessary that you find an HEIC converter which can process and output the photos shot by an iOS 11 iPhone into a more general format for Mac and Windows computer to read. What kind of HEIC converter should you choose? Which converter can help convert HEIC photos without quality loss? Read on to find out your answer. -	No quality loss in the conversion. -	Robust iPhone photos export/import function. 1. What is HEIC, Why We Need An HEIC Converter? What is HEIC, Why We Need An HEIC Converter? By taking HEIC as the brand-new standard of iPhone photo images, Apple first introduced it in 2017's September Event as a way to save high quality iPhone photos in smaller sizes as opposed to JPG, HEIC vs JPG comparison and why it matters. HEIC belongs to the HEIF standard, aka high efficiency image format, and is actually based on the HEVC – high efficiency video compression technology on iPhone. Users who want to export & view their photos shot with an iPhone 7/7 Plus/8/X, or the latest iPad Pro models powered with iOS 11 will really need the help of an HEIC converter, for HEIC won't show up on macOS Sierra (or any older mac or Windows 10 due to incompatibility problems. That been said, you may well consider one of the HEIC converters below to help you out in time. By the time you decide to go with an HEIC converter, it's important that you check through its compatibility with Live Photos, dual-lens camera photos captured in HEIC format – especially when you have an iPhone X or iPhone 7 Plus with that high-quality camera lenses. That been said, DearMob iPhone Manager is just a product of this kind: You may use it to convert HEIC to JPG, export iPhone photos by date/week/year, as well as import pictures to iPhone just a click away. First take a look at how to convert HEIC with this best HEIC converter. 3. You can use DearMob iPhone Manager to open HEIC on Windows, export & import HEIC as JPEG pictures, photos just as well. Step 2: USB-connect iPhone to computer, and by the time you see iPhone recognized by the computer, click on "Photos" to browse all photos on your iPhone. Step 3: Click on "Select All" or manually choose the HEIC photos you'd like to convert > hit the drag-down list of "Export Photos" before you click on "Convert HEIC to JPG". 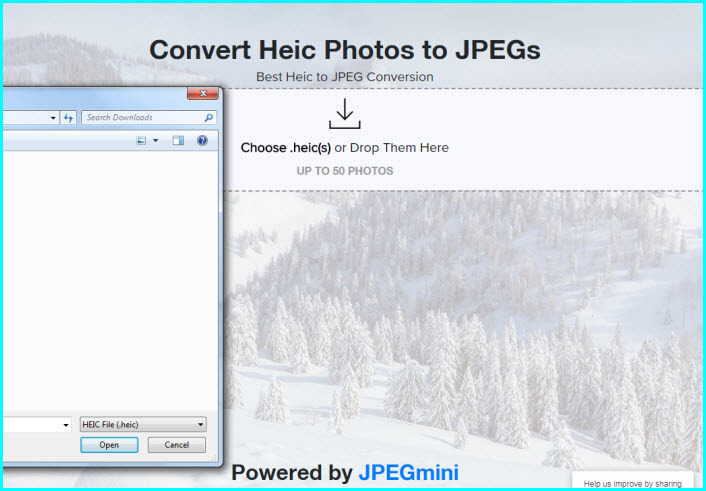 Step 4: Wait for this HEIC converter & manager to output your HEIC photos in JPG. It's downright easy to use DearMob iPhone Manager not only as an HEIC converter, by the time you download & install it, you'll find it extremely easy in 2-way photo transfer and add songs to iPhone. As one of the best HEIC converters, DearMob iPhone Manager can recognized photos in JPG JPEG PNG BMP TIFF GIF HEIC. If you're using DearMob iPhone Manager to take live photo picture and use DearMob iPhone Manager to export them all, what you'll get in the output folder will be a *.MOV format video and HEIC photo file, easily enabling you to view live photos with motions and audio on computer. Step 1: Visit https://heictojpg.com/ on your computer/Mac. Step 2: USB connect your iPhone to computer with an ORIGINAL Apple USB cable. Step 3: Click on the "Choose Photo" button on the webpage, choose the photos you'd like to upload and processed with this HEIC converter. Step 4: Now choose the HEIC photos from the DCIM folder of your iPhone, wait for the conversion to finish. Step 1: Install Dropbox for both your iPhone and computer. Step 2: First open this cloud server & HEIC converter on your iPhone, make sure that you upload all the HEIC pictures from iPhone to Dropbox. Step 3: On your computer, log in to Dropbox with the same account on your iPhone, by the time you see the HEIC photos, click to download them all to your computer or Mac. Step 4: By default, Dropbox download over-the-air pictures into JPG format, thus making it possible for you to use it as an HEIC converter. 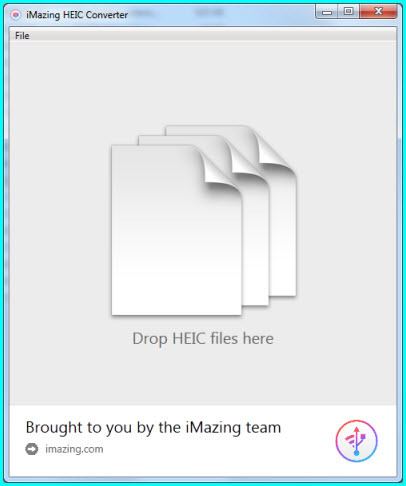 Just like DearMob iPhone Manager, the free application for Windows & Mac - iMazing HEIC Converter can easily convert HEIC to JPG/PNG with a drag-n-drop action. If all you need is an HEIC converter, consider this application. First take a look at how it can convert HEIC to JPG/PNG. Step 1: Download iMazing HEIC converter for Windows/Mac from the official website, install & launch it. Step 2: By the time you see the blank space saying "Drop HEIC files here", click to import HEIC photos from your iPhone X/8/7 (Plus). Step 3: Wait for iMazing HEIC converter to mass convert your HEIC photos into JPG. It's often easier to use a standalone HEIC converter such as DearMob iPhone Manager to manage your iPhone photos. It provides you with not only the function to convert HEIC to JPG, but also other features such as DIY ringtone & DRM removal. As the best iPhone photo management software, DearMob iPhone Manager supports pretty much any photo format you can imagine: HEIC, JPG JPEC PNG TIFF BMP, now click to download it below as the best HEIC converter. Can't open HEIC on Windows 10/8/7? If you're looking for an HEIC photo viewer Windows 10 to open HEIC HEIF photos, here's the quickest solution to HEIC won't open on Windows. How to download Smule songs from Smule Karoke, or download Smule video in original quality? This page introduces top 3 ways for you to download duets, songs and videos from Smule Karaoke in MP3 MP4.